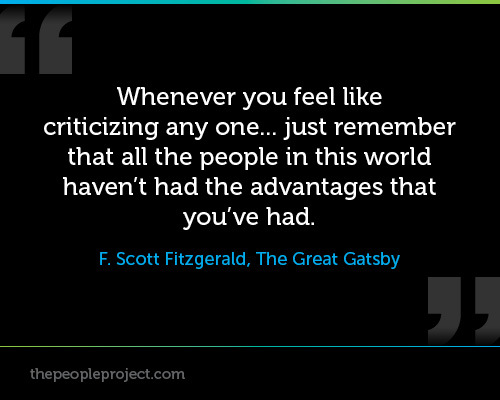 I love this quote from The Great Gatsby. Unfortunately it wasn't included in the movie. I finally got a chance to watch the new Baz Luhrmann version of The Great Gatsby a few days ago. I saw the trailer for it over a year ago (it was originally supposed to release in 2012, but it got delayed a few times.) It was right around the time I was planning a Roaring 20th birthday party. I decided to read the book and I loved it. I had read a series of books that referenced it a lot. (The Hollywood Nobody Series by Lisa Samson, which I would highly recommend for light reading. Kind of quirky, Christian teen chicklit.) I knew The Great Gatsby was "one of those classics everyone is supposed to read" and I knew it had a lot of glamorous parties. I expected it to really glorify that lifestyle, but found it was quite the opposite, and actually a complex and tragic story about people who have everything---except happiness. Anyway, I approached the movie with little hope that it would be an accurate representation of the book, but expected it to at least be really cool to look at. I was pleasantly surprised that they stuck to the details of the book quite closely. (Although it's been over a year since I read it, so I don't remember every little thing.) I would say the issues here aren't with plot elements and script, but more with the tone. Similar to Luhrmann's other movies (I've seen Moulin Rouge and Romeo + Juliet) it's a very visual, artsy experience. It was obvious that it was shot for 3D and I almost wished I would've seen it in 3D. I think it would've been less distracting. I didn't care for the parts where character's faces or text from the book were overlayed on the screen. I was glad that they mixed in some period music as well, but I actually liked the use of modern hip-hop for most of the soundtrack. I'm not a big hip-hop fan in general, but I actually liked most of the songs and thought they fit into the movie well. The blending of 1920's Charleston dance moves with hip-hop styles worked too. It was a very colorful, dazzling, shiny movie, which worked well for some things and not for others. 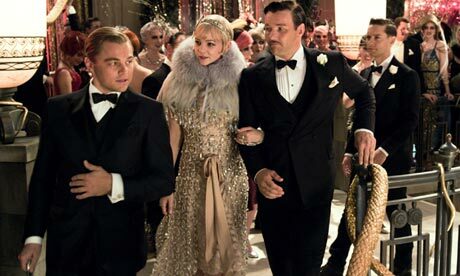 There are moments that are almost manic.The dizzying, glittery party scenes at Gatsby's were a bit disorienting, which matched the feeling I got when reading them in the book. However, some of the more intimate scenes came across overdone. There were sections of the book where you could almost feel the slow, muggy, suppressing heat of the summer days, and this movie didn't capture that feeling very well. (The Robert Redford version from the 70's does a great job with those sections.) For some of the scenes, I wanted to lose all the cinematic flash, and just see the actors, costumes and sets (because they were gorgeous!) I wanted to just be a bystander on the set, watching Daisy and Gatsby have a conversation in their fabulous 20's garb in their fabulous mansions. It was very well-acted. You can't really beat Leonardo DiCaprio (and his eyebrows) for these eccentric, swindler, billionaire-type roles (think The Aviator and Catch Me If You Can.) Carey Mulligan is one of those women who just seems like she belongs in another era, and she was fantastic as Daisy. I'm pretty sure the only other thing I've seen Joel Edgerton in was Star Wars (yep, he was young Owen Lars in Episodes II and III) so I honestly had no idea if he could act. His version of Tom Buchanan matched my mental picture of the character from the book perfectly. Tobey Maguire is a good choice for the slightly naive, dorky character of Nick Carraway. My one acting complaint, however was Maguire's attempt at being a desperate, stubbled (Is that a word? It should be) alcoholic and the voice he used as the narrator. As Spiderman 3 can evidence, the only way to make Maguire into an emotionally dark character, is by doing it comically. Along that line, I thought the frame story they did with Carraway was unnecessary and only added length to the film. I don't think we needed to see Gatsby's life story in flashbacks twice either. Honestly, I liked it better with his father telling it at the end of the story, like in the book. The way the book was written, there were definitely a few passages that I had to read twice before I understood what was going on, so maybe they were trying to make sure everything in the story was very clear. My favorite thing by far about this movie was the costumes. 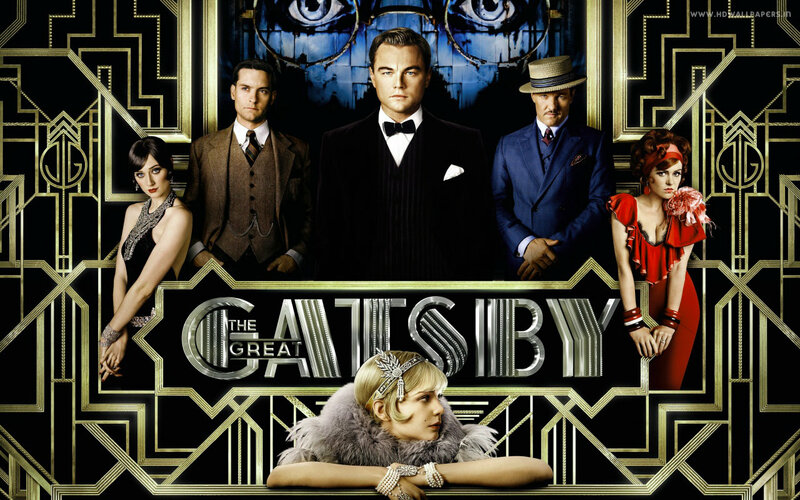 The Roaring 20's were all about opulence, and this film took it to a whole new level. In the party scenes, all the women sparkled from head to toe in glamorous gowns. 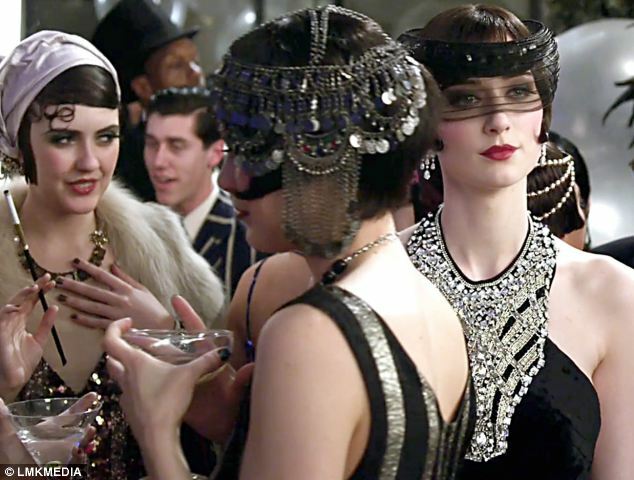 Daisy's first appearance at one of Gatsby's parties. Her feather and fur capelet, jeweled dress, and beaded headband were so gorgeous! Overall I would definitely recommend seeing this movie, if for nothing else than the beautiful costumes and sets. If you're a super stickler about book-to-movie accuracy, or don't care for Baz Luhrmann's style in general, you probably won't like it. 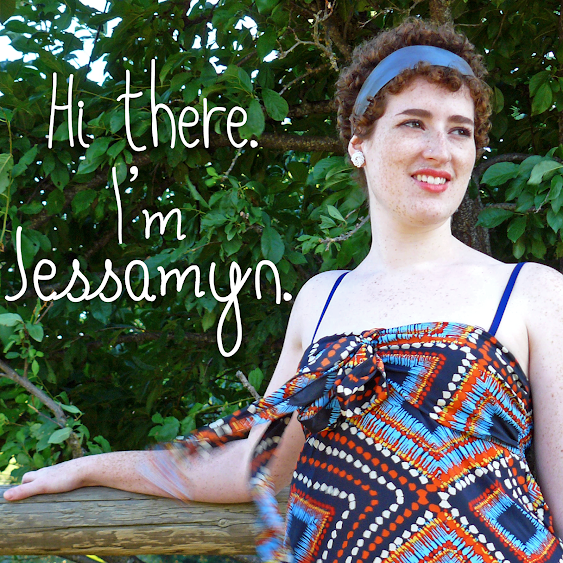 Share book reviews and ratings with Jessamyn, and even join a book club on Goodreads. Copyright GingerNifty. Simple theme. Powered by Blogger.